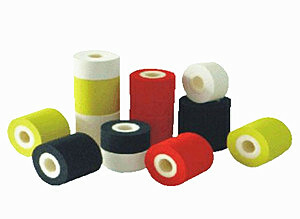 Zhuoli Group’ offers a variety of ink rolls for use in a wide assortment of contact coding ink applications. Our Hot Melt Ink Rolls are specialized foam rolls that are friction loaded with a variety of hot melt inks for use in hot ink contact coders. For over 15years Zhuoli Group has supplied the best ink roller alternatives on the market. Our hot ink rollers are 100% compatible and made to OEM specifications. We offer multiple ink formulations to match substrate, printer settings, and durability requirements. We offer more rollers per tray and a lower cost per roller than the OEM's.